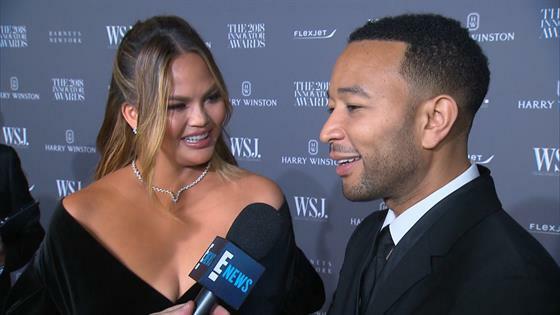 On Wednesday, John Legend and Chrissy Teigen took a break from their two children to attended the WSJ Magazine 2018 Innovator Awards in New York and it was clear they were already prepping for another big night on a town they have coming up this weekend...the 2018 E! People's Choice Awards. It was previously announced that Legend will be performing at the show as a part of his presenter duties in which he will be honoring the founder and executive director of the Equal Justice Initiative, Bryan Stevenson, with the People's Champion Award. When E! News caught up with the musician and his wife at the Museum of Modern Art this week, the two couldn't help but talk about their presenting duties. That's right, Teigen will also be presenting an award at the show and it's a little bit different than the one her husband is handing out—and perfectly fits her personality. "I'm so excited. I'm going to present Bryan Stevenson, who is somebody I've read," Legend told E! News at the WSJ Innovator Awards, which correspond with the annual Innovators issue for the magazine. "I've spent a lot of time with and just admire his work and everything he's done for the county. I'm excited to honor him." Teigen then piped in to reveal that she is actually a presenter as well, but she will be handing out the trophy for Reality Show of 2018. "And then I'm the opposite. I'm doing Best Reality. So, I cannot wait. I watch all the shows, I love it," she explained. "I can't wait to just see everybody in that room, too. I'm so excited"
Legend showed his wife and the category she's presenting a little love by adding, "They do a lot for the country too." "They really do," Teigen said. "For my mental health. It's like self-care." From the moment we knew that Legend would be honoring Stevenson during Sunday's broadcast of the 2018 People's Choice Awards we were hooked. Now that we know that his hilarious wife—and PCAs finalist in the Social Celebrity of 2018 category—is also a presenter, we are even more excited to tune in. To see Legend and Teigen take the stage and the red carpet, make sure to tune in to E! on Sunday, Nov. 11 for all of your show needs. The Live from the Red Carpet show begins at 7 p.m. on E! and will be followed by the 2018 People's Choice Awards at 9 p.m., so don't miss it!